The Outlook for Oil: What Lies Ahead? Surging oil prices are squeezing U.S. corporate profits, contributing to bankruptcies and forcing some companies, especially in the oil-dependent trucking industry, out of business altogether. With the threat of war in Iraq and a drastic cut in supply from strike-bound Venezuela, companies are braced for further increases soon. In the last year, the price of crude oil has jumped by two-thirds to about $33 a barrel in response to the prospect of war with Iraq, the fourth-biggest exporter in the Organization of Petroleum Exporting Countries. Crude’s gain has also been a reaction to the general strike in Venezuela which has cut supply from OPEC’s third-biggest exporter – and the most timely supplier of oil to the U.S. market – to about 10% of its normal rate. Higher prices and uncertainty about the outlook for supplies have overshadowed a business climate that is already dealing with a sluggish economy, fear of war in the Middle East and jitters about another terrorist attack on the U.S. mainland. The combination has deterred investment spending and reduced consumers’ disposable income. Managers are reluctant to invest while they are unsure about the direction of oil prices, whether the U.S. is going to war, or whether the economy will pull out of the current “soft spot” that Federal Reserve Chairman Alan Greenspan has cited. “Business people are concerned about the geopolitical outlook for the year ahead and that impacts capital spending prospects,” says Michael Cosgrove, principal of Dallas-based consulting firm The Econoclast, which provides economic analysis to capital markets. In the U.S. trucking industry, the average retail price of diesel has jumped 23% to $1.48 a gallon in the last year, forcing some 3,000 trucking companies out of business with the loss of about 40,000 jobs, according to Bob Costello, chief economist at the American Trucking Associations in Washington. Those closures were mostly small operations that are particularly sensitive to increases in fuel which accounts for up to a fifth of a trucking company’s costs. Severe winter weather in many parts of the U.S. this year has added to the truckers’ woes by driving up prices for heating oil, which is essentially the same product as diesel. In the airline industry, where United Airlines, the second-biggest carrier, and U.S. Airways are operating under Chapter 11 bankruptcy protection, the average jet fuel price jumped an annual 15.8% in November last year, the latest month for which statistics are available. In October, prices were 13.3% higher. In response, airlines are desperately looking for ways to reduce the weight, and hence fuel consumption, of their aircraft. Some carriers are even throwing out in-flight magazines and first-class telephones, says John Heimlich, director of economics and market research for the airlines’ trade group, the Air Transport Association, based in Washington. Other fuel-saving measures include taxiing with one engine rather than two and retiring older, less fuel-efficient aircraft. Ironically, their efforts will shortly be blunted by installation of the heavy cockpit doors required by the federal government under new anti-terrorism rules. AMR, the parent of American Airlines, the biggest U.S. carrier, blamed higher fuel costs in part for its record annual loss of $3.5 billion in 2002. Fuel costs, the airline’s second-biggest expense after wages and salaries, rose to $682 million, 21% above their level a year earlier. Fuel posted the largest increase of any major expenditure category. But analysts doubt whether OPEC, which supplies about a third of the world’s oil, can quickly pump enough to make up the shortfall that would be caused by the loss of the Iraqi supply of about 2 million barrels a day, in addition to the current absence of most of Venezuela’s normal contribution of around 3 million barrels. The shortfall would likely outstrip OPEC’s spare capacity, most of which is held by Saudi Arabia. And even when the Venezuelan strike is settled, it will take several months to restore supply to its normal level because of damage caused to improperly shut-down oil wells. The short-term solution is to draw on government-held reserves. These include the U.S. Strategic Petroleum Reserve, held on the Gulf Coast, which amounts to about 600 million barrels, or 30 days’ worth of U.S. consumption. It’s also the equivalent of 300 days’ worth of imports from the Persian Gulf. Further reserves are held by the Paris-based International Energy Agency and by the Japanese government. In all, the world has an estimated 1.25 billion barrels of oil in strategic reserves, and governments stand ready to use them in the event of a major disruption in supply such as war in the Middle East. Oil supplies from other Middle Eastern countries such as Iran could also be threatened if Israel retaliates against an attack from Iraq. Any Israeli involvement would probably result in the U.S. losing the support of all its Middle Eastern allies in a war against Iraq, Henisz says. Oil from the Persian Gulf region accounted for 18.2% of total U.S. imports in October 2002, the latest month for which data is available, according to the American Petroleum Institute. There is a greater chance this time that the U.S. will not achieve its objectives because they are more complicated – the removal of a regime – than they were in the 1991 campaign which focused on ejecting Iraqi forces from Kuwait, Henisz adds. Any prolonged occupation of Iraq by U.S. forces could further fan anti-U.S. sentiment in the region. 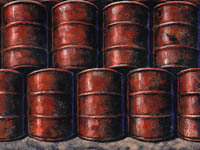 Although producers and governments will seek to stabilize supplies, the price of oil on international markets will continue to reflect anxiety about the security of supply, and can be expected to rise to $40 or higher, perhaps exceeding the previous Gulf War high of $41, in the immediate reaction to a U.S. invasion of Iraq, analysts say. “If there’s a war with Iraq and Venezuela is still out of commission, we’re expecting oil as high as $44 a barrel,” notes Phil Flynn, a market analyst for Alaron Trading, a futures brokerage in Chicago. Whether that price is maintained would depend on how long the war goes on, whether it spreads to other areas of the Middle East, and whether the Iraqi regime takes steps to permanently disable its own oil industry in retaliation to an invasion, as it did to the Kuwaiti oil fields in 1991. According to Flynn, “the biggest concern is whether Saddam Hussein destroys his own oil fields.” Such an act could remove at least 2 million barrels a day from world supply in the long term. Despite such apocalyptic visions, futures markets are anticipating lower oil prices by the summer. On Jan. 24, the New York Mercantile Exchange June contract for West Texas Intermediate, the U.S. benchmark crude, was trading at $29.60 a barrel, or $2.67 below the price for March, the most actively traded contract. The December 2003 contract shows the market expects a further decline of almost $3 to $26.25. The lower prices signal an assumption that war in Iraq will be brief and will succeed in installing a U.S.-friendly regime that is committed to providing secure oil supplies to the West. It’s also based on speculation that Venezuelan supplies will be largely restored by that time. In addition, lower futures prices assume a normal seasonal drop in demand from the northern hemisphere after higher winter usage.